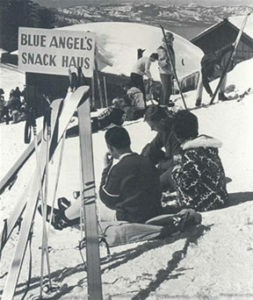 The Angels’ official club house was the Blue Angels Snack Haus located on the mountain, and was renowned for its exquisite lake view dining and sun decks complements of mother nature. 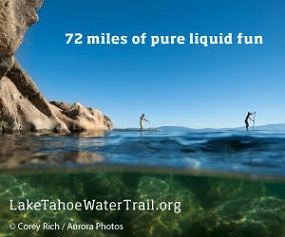 Skiers would meet to grab a bite, drop off their backpacks and enjoy magnificent views of Lake Tahoe and fresh air “the same the angels breathe” (Mark Twain); just like today’s visitors, locals and Face Rats. Today, retired and aspiring Blue Angels can be found enjoying the scene at their newest unofficial club HQ, the Blue Angel Café located on Ski Run Blvd. One of the original Blue Angel fabric logos that graced a racer’s jacket is framed and hanging on the wall downstairs. And, you’ll find skiers and ski racers hanging out near the fireplace and bar braggin’ about their day. Skiing at Heavenly and in South Lake Tahoe dates back to 1947 when Lee and Daisy Miller operated a tow rope using the back wheel of a Model T pickup truck to pull skiers to the top of the hill on Bijou Skyway Park (today’s Ski Run Boulevard). In 1955, Chris Kuraisa purchased Bijou Skyway Park for $1,950 and moved up the hill and opened the California Base Lodge with one lift, naming the area Heavenly Valley.